Ovidiu listed this book among the ones that had the biggest impact on him. I am currently reading The Seven Habits of Highly Effective People and I’ve already experienced subtle changes in mindset that can help me do more with the resources I have, so I’m closely following my goal. This book is a revelation! I’ve seen it be recommended so many times that I was almost sure it couldn’t possibly live up to the hype. Contrary to my expectations, it did and quite brilliantly. First, a word on career paths. In time, I realised that career paths are like one-way streets. Magic happens in unexplored territories. Plus life is how you choose to live every moment, every day. So today, rather than building a career, I prefer to make lateral moves in life, working with great people and being part of ambitious projects impacting the world. There are a few books that got me here: [...] Stephen R. Covey "7 Habits of Highly Effective People". Also Stephen Covey had a strong influence on me in terms of management and business some years ago and the advice in his book The 7 Habits of Highly Effective People are still the principles I turn to in my life always. This revolutionized my work day! The Best! This book blew me away when I first read it. It was written in 1989 so the ideas won't seem new or groundbreaking. The author has a particular way of putting things that just makes sense to me. I loved this book so much that I read it again as soon as I finished it. I go back and reread it every couple of years. It's that good! At a young age it wasn’t the academical books as the material presented at school wasn’t that interesting but I was lucky that both my parents loved reading and I was brought up to read and it became a habit. Later at life the first book that had an impact on me was “7 Habits of Highly Effective People” that made me question certain things about my life and my perspective towards it. As for my career I would say it’s “Act Like a Leader, Think Like a Leader” “Working Identity” & “Coach & Couch". This book is very helpful and insightful book that I like to refer back to when my schedule or commitments get too rushed or chaotic. Sometimes we have to step back, re-prioritize and refocus to stay effective and proactive rather than falling into the trap of becoming just reactive. This is a great book for that purpose. When I read The 7 Habits of Highly Effective People I was hungry to set a direction for my life and to start making things happen. I was 25 years old, but did not understand anything about how business or careers worked. I assumed you worked for a company and stayed there forever or that there was supposed to be a career ladder. This book showed me that for win or lose it was going to be up to me and the actions I took along the way. My favorite business book is probably the 7 Habits of Highly Effective People as it's helped me focus on the things that really move the needle. I still remember reading 7 Habits Of Highly Effective People when I was in my mid-twenties and trying to determine the course my life would take. The idea of sharpening the saw hit me hard, and I remember dedicating myself to daily study and improvement at that very moment. It has paid profound dividends in my life ever since. It provides an excellent framework for life design. Being a successful entrepreneur requires you to truly internalize why you do what you do and how it connects to your inner values, motivations, and goals. This book will help you build your own framework to help you achieve that. The essential companion workbook to the international bestseller The 7 Habits of Highly Effective People. Stephen Covey’s The 7 Habits of Highly Effective People took the self-help market by storm in 1990 and has enjoyed phenomenal sales ever since. The integrated, principle-centered 7 Habits philosophy has helped readers find solutions to their personal and professional problems and achieve a life characterized by fairness, integrity, honesty, and dignity. Covey’s tried and true step-by-step approach is explored even more fully in this workbook, which leads readers through the 7 Habits and shows them how to put these ideas into action everyday. With the same clarity and assurance that Covey’s readers have come to know and love, the workbook helps readers further understand, appreciate, and internalize the power of the 7 Habits. These engaging, in-depth exercises allow readers—both devotees and newcomers—to get their hands dirty as they develop a philosophy for success, set personal goals, and improve their relationships. The overwhelming success of Stephen R. Covey’s principle-centered philosophy is a testament to the millions who have benefited from his lessons, and now, with The 7 Habits of Highly Effective People Personal Workbook, they can further explore and understand this tried-and-true approach. This reference offers solutions to both personal and professional problems by promoting and teaching fairness, integrity, honesty, and dignity. 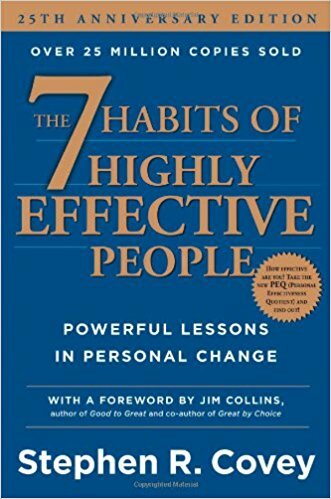 An engaging companion to a bestselling classic, The 7 Habits of Highly Effective People Personal Workbook will help readers set goals, improve relationships, and create a path to life effectiveness.